RETURNING HOME TO CALIFORNIA after his graduation, twenty-year-old Benjamin Braddock (Dustin Hoffman) is uncomfortable with the reception his lawyer father (William Daniels) and mother (Elizabeth Wilson) have thrown for him at their luxurious home in Beverly Hills. Unsure of his future and overwhelmed by the unwanted attention, Ben escapes to the safety of his bedroom only to be pursued by his father's partner's wife, the attractive and forceful Mrs Robinson (Anne Bancroft), who demands that he drives her home in the Alfa Romeo sports car he was given as a graduation present. Cleverly attempting to seduce Ben but making him feel foolish for thinking that she was, she makes a proposition to him, which he rejects until after his 21st birthday, when his parents arrange another embarrassing party for him. Ben and Mrs Robinson begin their clandestine liaison, but when her daughter Elaine (Katharine Ross) returns from university her father and Ben's parents throw them together. Ben humiliates Elaine and then regrets he has hurt her, taking her to the same hotel he visits with her mother where, thanks to an indiscreet hotel worker, Elaine guesses he is seeing a married woman. Attempting to stop the affair, Ben is horrified when Mrs Robinson threatens to tell her daughter her version of events and tells Elaine, with whom he has become infatuated, first; however, her mother insists that Ben took advantage of her while she was drunk. But her father forbids Elaine to see Ben, pushing her towards former boyfriend Carl Smith (Brian Avery), whom she agrees to marry, and a devastated Ben attempts to find her to stop the marriage. A sensation on its original release, The Graduate was a unique cinematic portrait of America that perfectly captured the undercurrent of disaffected youth beneath the laid-back veneer of Sixties California. Mike Nichols earned a Best Director Oscar and took the wonderfully evocative music of Simon & Garfunkel out to a wider audience. The Graduate contains one of the most famous seductions in movie history and an iconic final scene. The young Dustin Hoffman was introduced as the naïve and confused Benjamin and could not have been more perfect for the role. Anne Bancroft is a masterful cougar. Described as visually imaginative and impeccably acted, with a witty, endlessly quotable script, The Graduate had the rare kind of cultural impact that comes along just once in a generation. Amusing and well-observed, The Graduate is highly enticing with a remarkable cast and is a fascinating piece of movie history. The Graduate also features: Scriptwriter Buck Henry as The Room Clerk; Walter Brooke as Mr McGuire; Norman Fell as Mr McCleery; Alice Ghostley as Mrs Singleman; Marion Lorne as Miss DeWitte; and Eve McVeagh as Mrs Carlson. Interesting to see television actor Ben Murphy (Alias Smith & Jones) as Shaving Student. Music is by Paul Simon; Score by Dave Grusin; Featuring the Music of Simon & Garfunkel; Director of Photography is Robert Surtees; Screenplay by Calder Willingham & Buck Henry, Based on a 1963 novel The Graduate by Charles Webb; Executive Producer is Joseph E Levine; Produced by Lawrence Turman; and Directed by Mike Nichols. 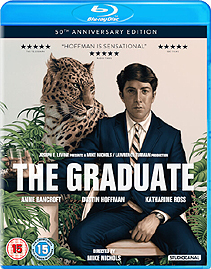 * The Graduate is one of the most loved American films of all time and, fifty years after its theatrical release in 1967, STUDIOCANAL celebrates this anniversary with a brand new Special Edition DVD, Blu-ray and EST release in the UK on 14 August 2017. Note that this 50th Anniversary 4K restoration was created from the 35mm original camera negative by the Criterion Collection. Special Features  Mike Nichols: An American Master | Interview with Producer Lawrence Turnman | The Graduate: Looking Back | Analysis of Seduction Scene | About The Music | Screen Tests | Meeting with Author Charles Webb | Interview with Dustin Hoffman | Audio Commentary with Mike Nichols and Seven Soderbergh | Audio Commentary with Dustin Hoffman and Katharine Ross | Audio Commentary by Professor Thomas Koebner | The Graduate at 25. The Special Edition includes a booklet featuring a brand new essay written by Time Out Global Film Editor Dave Calhoun and exclusive on-set photographs by the legendary Hollywood photographer Bob Willoughby. Artwork is designed by the award-winning Mondo artist Rory Kurtz.